Dynamic Host Configuration Protocol (or short dhcp) is a standard tcp/ip protocol that distributes ip configurations to clients. dhcp is defined in rfc 2131 (before that it was defined as an update to bootp in rfc 1531/1541. The alternative to dhcp is manually entering the ip configuration on each client computer. dhcp works with layer 2 broadcasts. A dhcp client that starts, will send a dhcp discover on the network. All dhcp servers (that have a lease available) will respond with a dhcp offer. The client will choose one of those offers and will send a dhcp request containing the chosen offer. The dhcp server usually responds with a dhcp ack(knowledge). In wireshark it looks like this. When this procedure is finished, then the client is allowed to use that ip-configuration until the end of its lease time. 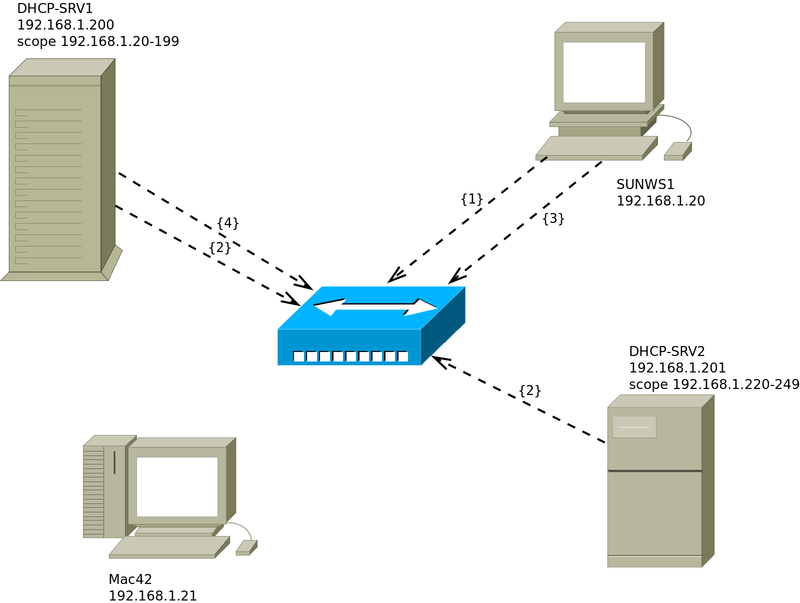 Here we have a small network with two dhcp servers named DHCP-SRV1 and DHCP-SRV2 and two clients (SunWS1 and Mac42). All computers are connected by a hub or switch (pictured in the middle). All four computers have a cable to the hub (cables not pictured). 1. The client SunWS1 sends a dhcp discover on the network. All computers receive this broadcast. 2. Both dhcp servers answer with a dhcp offer. DHCP-SRV1 is a dedicated dhcp server and is faster in sending a dhcp offer than DHCP-SRV2 (who happens to also be a file server). 3. The client chooses the offer from DHCP-SRV1 and sends a dhcp request on the network. 4. DHCP-SRV1 answers with a dhcp ack (short for acknowledge). All four broadcasts (or five when you count both offers) can be layer 2 ethernet broadcast to mac address ff:ff:ff:ff:ff:ff and a layer 3 ip broadcast to 255.255.255.255. The same story can be read in rfc 2131. You get a configuration file with many examples. Installing is easy with yum. After installing we get a /etc/dhcp/dhcpd.conf that points us to an example file named dhcpd.conf.sample. So we copy the sample and adjust it for our real situation. We name the copy /etc/dhcp/dhcpd.conf. The 'routers' option is valid for the subnet alone, whereas the 'domain-name' option is global (for all subnets). Time to start the server. Remember to use systemctl start dhcpd on RHEL7/CentOS7 and service dhcpd start on previous versions of RHEL/CentOS. You can reserve an ip configuration for a client using the mac address. You can add individual options to this reservation. Below you see several sections of /etc/dhcp/dhcpd.conf on a Debian 6 server. Above the general configuration for the network, with a pool of 180 addresses. For dhcpd.conf on Fedora with dynamic updates for a DNS domain. Generate your own keys with dnssec-keygen. Also make sure that bind can write to your db.zone file (using chmod/chown). For Ubuntu this can be in /etc/bind, for Fedora in /var/named. DHCP servers should not be a single point of failure. Let us discuss redundant dhcp server setups. To avoid having to place a dhcp server on every segment, we can use dhcp relay agents. Rogue dhcp servers are a problem without a solution. For example accidental connection of a (believed to be simple) hub/switch to a network with an internal dhcp server. DHCP can dynamically update DNS when it configures a client computer. DDNS can be used with or without secure keys. 1. Make sure you have a unique fixed ip address for your DNS and DHCP server (easier on the same machine). 2. Install DHCP and browse the explanation in the default configuration file /etc/dhcp/dhcpd.conf or /etc/dhcp3/dhcpd.conf. 3. Decide on a valid scope and activate it. 4. Test with a client that your DHCP server works. 5. Use wireshark to capture the four broadcasts when a client receives an ip (for the first time). 6. Use wireshark to capture a DHCPNAK and a DHCPrelease. 7. Reserve a configuration for a particular client (using mac address). 8. Configure your DHCP/DNS server(s) with a proper hostname and domainname (/etc/hosts, /etc/hostname, /etc/sysconfig/network on Fedora/RHEL, /etc/resolv.conf ...). You may need to disable NetworkManager on *buntu-desktops. 9. Make sure your DNS server still works, and is master over (at least) one domain. There are several ways to do steps 10-11-12. Google is your friend in exploring DDNS with keys, with key-files or without keys. 10. Configure your DNS server to allow dynamic updates from your DHCP server. 11. Configure your DHCP server to send dynamic updates to your DNS server. 12. Test the working of Dynamic DNS.